Warm the heavy cream in a pan on the stovetop, bringing it to 140F to 158F (60 to 70C). Add the saffron threads and seal the pot with plastic wrap (cling film), remove from the heat, and let steep for 2 hours. After two hours, return the pan to the stovetop and bring the heavy cream up to to 176F/80C. Fill and preheat the water oven to 185F/85C. In a bowl, beat the egg yolks with the sugar until the sugar is almost fully dissolved and the eggs are pale and fluffy. Slowly pour in the hot cream, one ladle at a time, whisking it into the eggs to temper them. Blend well. Transfer the custard mixture to a large (gallon/3.8 liter) zip-closure cooking pouch and using the displacement method (Archimedes’ Principle), evacuate the air and zip the seal. Submerge the pouch in the water oven to cook for 1 hour. When the custard mixture has cooked, open the pouch, pour the mixture into individual ramekins; cover and refrigerate for 24 hours. 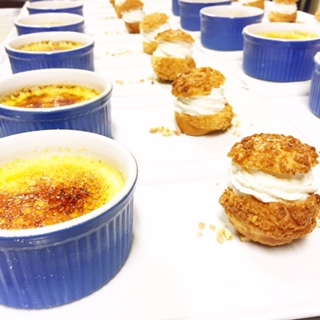 Before serving, bring the custards to room temperature; lightly dust the top of each individual ramekin with sugar and using a blow torch, burn the sugar until golden brown.